This hearty, greek-inspired halloumi lamb sausage tomato stew beautifully combines all the familiar greek cuisines flavours – lamb, halloumi, olives, oregano – and it is possibly the best dinner recipe to warm your body (AND SOUL) on a cold night. Cook the sauce in a pan and finish it off in the oven – EASY. The best part of this stew? It definitely is the golden brown, crispy halloumi that tastes divine when perfectly grilled. 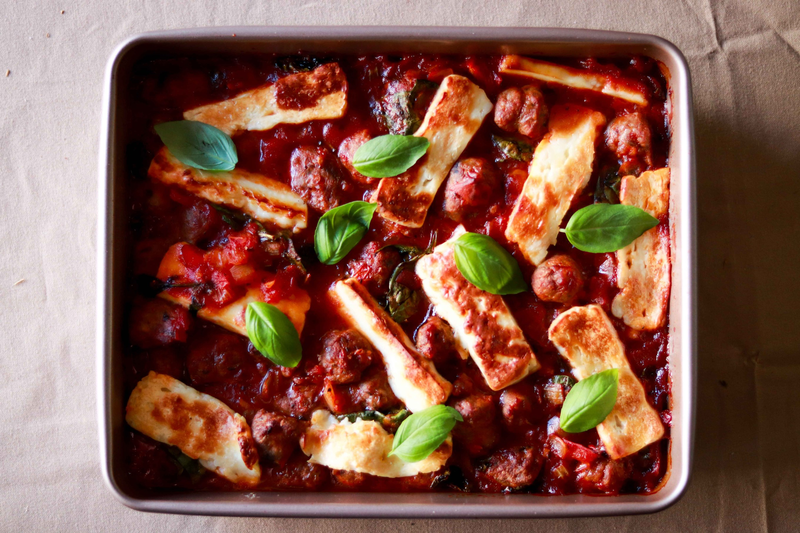 This recipe was inspired by the Sausage Halloumi Bake by Lucy Loves. The moment I saw the recipe my mind already went crazy thinking about how good it would taste. If you know me well, you’d know that Greek food is my favourite cuisine and lamb is my favourite meat type at all times, so yeah, I’d kill for a souvlaki lamb wrap right now. Anyway, I wrote this recipe with the three main ingredients in mind – lamb sausage, halloumi and tomato – and I added some twists to it. I always like working with red sauce because it simply never goes wrong; so flavourful and nutritious at the same time. To accentuate the mediterranean theme and to give a little sweetness for taste balance, I added some dried oregano and olives to the sauce as well. You can basically do anything with this stew – eat it on its own, mix it with pasta, or dip it in bread etc. And of course, feel free to use your own imagination and creativity to make changes to the recipe – play with the sausage type and throw in whatever ingredients you like to make it your own best stew. I promise you that you’re going to love it! And again, thanks for reading my blog and have a good weekend! In a large sauce pan, heat olive oil over medium heat. Add sausages and cook until golden brown (they don’t have to be fully cooked as they will continue cooking in the oven). Take them out and set aside. In the same pan, add onions and saute until translucent, about 3-4 mins. Add garlic and cook for another 1 minute (be careful not to burn the garlics). Add tomatoes, tomato paste, sugar, olives, and dried oregano. Cook for about 3 mins until tomato starts to release juice. Add ½ cup of water if the sauce becomes too dry. Add baby spinach and stir and let it wilt. Reduce heat to low, add sausages back to the pan and let it simmer for about 2 minutes. Add salt and pepper to taste. Transfer the stew mixture to a baking dish, evenly put the halloumi cheese slices on top. Grill for 15 mins until golden brown. Garnish with fresh basil leaves. Serve immediately.